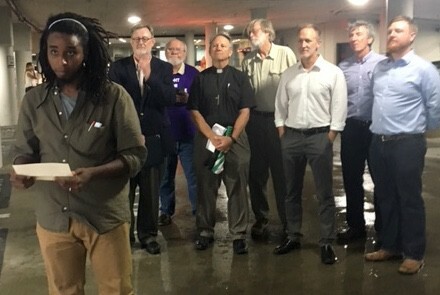 A group of Tennessee dads gathered inside a dimly-lit parking garage on a rainy Nashville day to send a message to their senators, Bob Corker and Lamar Alexander. Their message was simple: this Father’s Day, they want their senators to protect Medicaid. Senator Alexander, Senator Corker, we gather here today as fathers, with Father’s Day mere hours away, to share with you our concerns with the course of action currently being set in Washington. We are fathers of children with disabilities. We are imploring you to vote to save Medicaid, and the other “lifeline programs” that are currently facing unprecedented funding cuts. This is a course that, left unchecked, WILL have dire negative consequences for our sons and daughters. The Tennessee dads were speaking father to father – imploring Alexander and Corker to think of their own children, and all of Tennessee’s children, when they cast votes on the Senate’s health bill, which includes deep Medicaid cuts. Vote to ensure that the Medicaid funded supports and services that our sons and daughters use every day just to survive in the community will NOT have to go away because of funding cuts. Shouse was joined by Jama Mohamed, Michael Nolan, John Sharp, Mike Franks, and Matt Steinhauer in appealing to Tennessee’s U.S. Senators. All agreed the best Father’s Day gift they could receive would be an assurance that Medicaid would continue to be available for all children who need it, especially those with disabilities.